Finally the contest I’ve been waiting for! Hope to get a few artists I know to do a few I’ll post as well. POSTED BY ROBERT MANKOFF Our Caption Contest has demonstrated that when courageous captioneers are given an unusual drawing, they will come up with a suitable caption. And a feature that we ran in the Cartoon Issue demonstrated that when we give cartoonists a commonplace phrase, they can come up with an apposite drawing. Recently, I wondered if it would be possible to reverse-engineer a Cartoon Caption Contest. Below is a list of captions that all describe a cartoon that has been published in The New Yorker. Put on your reverse-engineering hats and tell me what the image is (the Cartoon Bank is a good place to start looking). What do you get for correctly identifying the cartoon? Ah, come on, after all I’ve done for you? O.K., how about a signed electronic copy of the cartoon with either the original caption or with one of the captions that you like below. In either case, just e-mail your guess to cartoondepartment@gmail.com. Sign up to receive the weekly Cartoon Newsletter. Came across this in Bob Mankoff’s blog today. You should check out Saul Steinberg’s cartoons, they are a nice blend of cartoon humour and art and philosophy as Bob points out and anyone with a headshot like this deserves a look. Anyway what caught my eye was the word balloon. Something that I have been messing around with lately. Or at least words not necessary to read in sentences or spoken phrases. or in the case of my personal favourite balloons, maybe it should be punctuation only. I often wonder about the hang up with words. I’ve been told many a time that it’s not just language. A while back I posted Bob’s investigation of captions vs. captionless cartoons. Personally, I enjoy the wordless joke, saying so much without the need for language, though I am fond of wordplay which I often find myself talking about while out for coffee (coffeeng?). Bit of a stretch there. 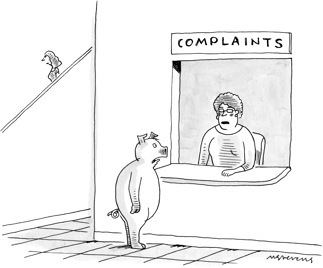 I am not entirely against captions, but so often you get a bad gag or poorly written or readers can challenge it with something better, which I suppose is the nature of the New Yorker caption contest. Worst of all is the atrocity committed by Family Circus on a regular basis. 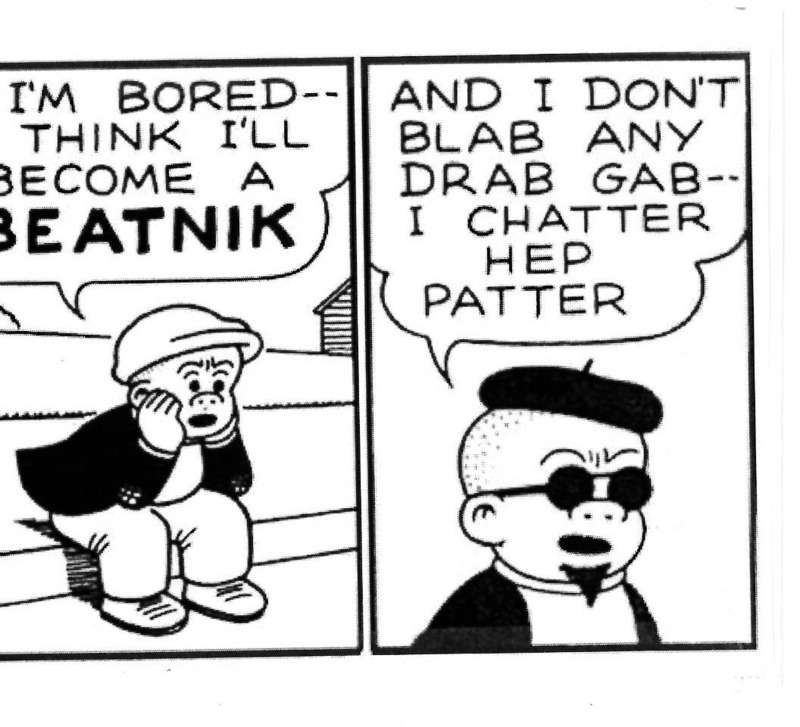 Word balloon and continued speaking part in the caption. Drives me crazy when I see cartoons put together like this. If you’re going to do word balloon and caption, at least do it right. As I look around for inspiration, I often find myself looking at the cartoons of the New Yorker and cartoon editor Bob Mankoff’s blog postings. The latest deals with a chicken or egg scenario in the approach to cartooning that mirrors automatic writing and drawing. Of course, we all know the answer to which came first. Eggs. Chickens simply haven’t been around as long. So, what came first the drawing or caption. Not sure if the caption or the drawing is the chicken or the egg, but in the case of something like the Far Side, I can imagine Gary Larson sitting at his desk drawing some ludicrous scenario and captioning it later. Here’s Jack Zeigler’s take on doodle first. I’m sitting in a comfortable chair, doodling on a clipboard in search of an idea. I’m on my second or third cup of morning joe. I try not to raise my eyes from the blank sheet of paper on the clipboard because there are too many distractions in the room—and I’m easily distracted. If I allow my eyes to light on any of the spines on any of the books, LPs, or CDs on the shelves that surround me, I’m a goner. Not to mention the pictures on the walls, mostly framed cartoon originals accumulated over the years from friends in the profession. If I look up, I know there’ll be one of these pictures that needs straightening, and if I give in to that urge I’m just asking for that Jesse James moment—the bullet in the back from that dirty little coward who shot Mr. Howard, which would be the biggest distraction of all. I’m trying to come up with cartoon ideas. I find that if I have nothing written down already—a preconceived idea or setup, say—I generally start my doodling process, my search for something tangible, by drawing a man’s head. Sometimes the face will look like there’s something going on just out of my eyesight. What is it? I have no idea, but I go ahead and attempt to draw it anyway. Today I’m looking at this guy’s head from a 3/4 angle behind him. I give him a cowboy hat, because is there any person more fun to draw than a cowboy? Probably not. I should probably put him on a horse. The horse I’ve drawn seems to be looking down, so maybe he’s high up on a hill that both of them in their prairie wanderings have just happened upon. There’s obviously something down there in the valley below. I’ve dressed my cowboy in a jacket that looks vaguely modern. Possibly shearling? Kinda screams Ralph Lauren in a Western mojo, doesn’t it? It’s then just a short, logical hop of the imagination from that jacket to a shopping mall, isn’t it? So I draw the mall down there in the valley, surrounded by a lotful of cars. What’s the cowboy going to do? Rein his horse off to the right in order to skirt the mall? Or will he succumb to an urge to shop? And if that’s the case, shopping for whom? His wife? Girlfriend? Himself? Nope. For me, it’s generally the case that an idea for a cartoon springs from a tiny germ that I keep adding to until it builds into something that slowly begins to make a semblance of sense. Sometimes this construction project can be quite elaborate and consume an hour or more, but ultimately lead to a dead end. Other times it can take a mere few minutes and get me somewhere worthwhile. Either way, the journey can be fun, and occasionally one finds a jackpot at the end. I don’t doodle. I’ve got nothing against folks who do, but I’ve never come up with a decent cartoon idea that way. When I need an idea, which is always, I sit down with a full pot of coffee and a blank sheet of paper and I write. I’ll jot down a phrase I’ve heard or just a single word. It can be something that feels sorta funny to me or not. It’s just something to get the process started. Occasionally it’ll be words that describe an image or concept, like I might write down “dog afraid of vacuum cleaner” or “two beavers talking,” but I never draw those things until I’ve actually got a joke idea. A good example of how this typically works is in this cartoon. I started by jotting down the words “writer’s block.” For some reason, these words pop into my head a lot during writing sessions, as do the phrases “I got nothing” and “I should have gone to law school.” Anyway, I started by playing with those words. First I thought of alternative meanings of the words themselves. So “writer’s block” could be a city block where writers live. It could be writers playing with children’s building blocks, or a football block performed by a writer. You can see there’s probably a joke to be had among those options, but I don’t think it would be a very good one. Might be more “punny” than funny. You could mess around with the “writer” part of the phrase, too, and make it “rider’s block.” You could take that as far as you wanted and get “horse-rider’s block” or “subway-rider’s block.” I don’t think I pursued that angle very much. I mostly thought in terms of replacing the “writer” with another occupation. I jotted down things like “dentist’s block,” “taxidermist’s block,” “proctologist’s block,” “ventriloquist’s block,” and then a bunch of occupations that end in “-er” like “plumber’s block” and “butcher’s block” (which has its own punny potential). In the end, I found the gag by adding words to the phrase. Where can you add words to it? In the middle? Not really. At the end? “Writer’s block and tackle.” “Writer’s blockade.” At the beginning? Sure, “copywriter’s block,” “grant-writer’s block,” then eventually I came to “skywriter’s block” and BAM, there’s the idea. And it came fully intact. I immediately saw the whole image exactly how I ended up drawing it here. That’s the best part of doing this for a living; going from the moment when you have no idea at all to the moment when you have an idea. In a way I think it’s the same experience for the reader, except it happens a lot faster. Hopefully. So that’s how I get ninety per cent of my ideas. Some come other ways, and I’ll take ’em any way I can, but mostly it’s this rational, relentless pursuit. Doodling seems like an unnecessary step, and, honestly, my mind-set when I’m drawing isn’t really a creative mind-set. It’s a mundane-task mind-set, like folding laundry or doing dishes. Sure, a cartoon can flit into my mind while doing those kinds of tasks, but it’s rare and I’m better off doing dishes than doodles, because if it doesn’t happen at least I’ll have clean dishes. I need that more than I need another stack of Diffee doodles. People work in different ways and I am particularly interested in the doodle first approach because that is what I find myself doing a lot and taking ideas from those doodles. In a sense both modes work as automatic exercises, though in a more organised way. This isn’t always entirely random, but I am intrigued by the fact that both cartoonists start with a blank canvas avoiding all distraction. The New Yorker caption contest plays out like a doodle first assignment. You get a drawing and then you find an appropriate caption. My captions usually come in the midst of a ballgame when my mind has had a rest from the image for a while. Incidentally, I didn’t win the latest edition of the New Yorker caption contest. Thought I was a shoo in this time. Of course as Bob mentions then there are also cartoons with no caption.